Hear the heart warming story behind this unique creation by DJ Tyler Johnston. The guided meditations of Goddess & Child - Meditations for the Inner Child resonant well for many world wide and especially for therapists since many of the reviews for this unique CD are from psychotherapists, counselors and social workers who recommend it for their clients.
" It left me feeling connected and empowered. Thank you so much. I will recommend it to my clients with great confidence." "The CD is a deeply moving and healing journey. I have been using it daily and sharing it with others." "The way you are teaching people to self-love and love parts of self is first rate. A wonderful CD. I have recommended it to my clients." “Your CDs have been an enormous gift for me, especially during the times that I stay alone in the country. I was thrilled to discover the ‘Creating a Safe Space” meditation from Goddess & Child. "Marzo’s "MA" recording has got to be one of the most soothing and connecting meditative tracks on planet Earth"
"This is an excellent meditation CD. The relaxation worked better than anything I have ever experienced." Goddess & Child is a heart-touching collection of guided meditations. 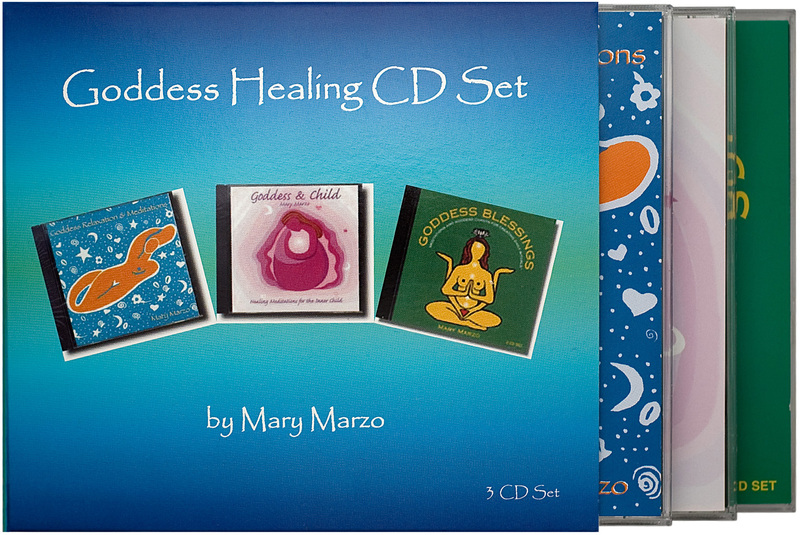 Mary's soothing voice takes the listener deep within to gently connect to their inner child and the loving arms of the Goddess - teaching self-love, self-mothering and self-compassion. Coming Home - Creating a Safe Place (23 minutes) is a magical guided meditation that takes you by a river into the healing lap of Mother Earth. You create a sacred healing circle (with all your guardians, protectors and spirit guides), focus on the different parts of your inner child and begin to connect to the profundity and wisdom that lies right at the core of your inner child. 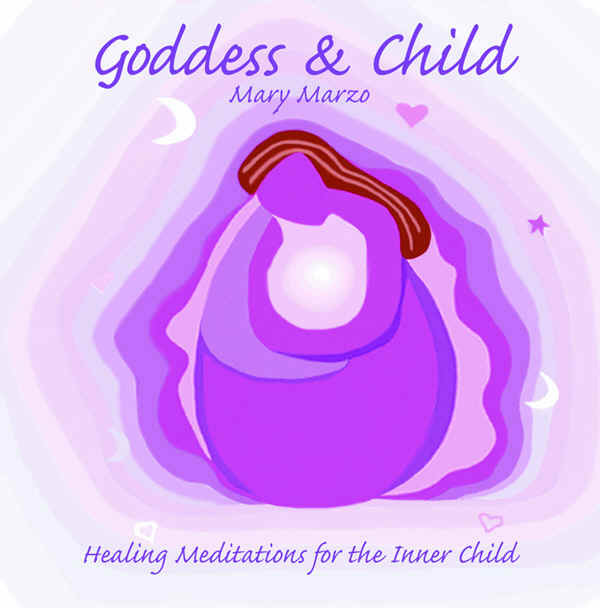 In Goddess & Child, Mary has gone deeper, touching a healing space that all who are on their healing path must, at some point, go through - connecting to their inner child. Overall, this CD is a valuable companion and guide for anybody's healing journey. "Listening to the CD was a very enriching experience which allowed me to connect easily to the various levels of my inner child. It is very accessible and it beautifully dissolved any barriers. There is a simplicity and purity that got right into me." ~ Mark J. "As a new mother, I have very little time for myself. So, I listen to the CD while I’m jogging. It makes me feel free, like I’m flying. It takes all the gravity away. It makes it so Zen like. It’s my new high. It’s the best." ~ Emily W.
"I used the MA chant in a fall equinox ritual with my women’s group. It was very beautiful and touched us deeply. It was just the right thing. All the women wanted to know where to buy it." ~ Kathy V.
"The first time I heard it, I was speechless. I could not share in words how it had touched me. The first thing I could express was a drawing – of rainbow tears falling from the child and gathering at the bottom to form a rainbow spiral. I felt an amazing connection that came from my heart to my little girl within. Thank you." ~ Bev M.
"Thank you. Once again you have helped women to heal and be in touch with our feelings. This is a beautiful piece of work. It enables me to be in touch with all that I have been through and not shy away from the pain - so it can heal." ~ Dina M.
"Congrats on your new CD and continue with your great work. Our world truly needs it." ~ Irene D.
I don’t believe that it was a coincidence that I twice fell into a deeply relaxing and refreshing sleep, either during or shortly after listening to Mary Marzo’s extremely soothing guided meditations. Marzo’s meditations are so accessible and gently reinforcing that one doesn’t feel as if one has to "work" and strain to get results; her tone is nurturing and soothing, creating a verbal sanctuary and respite from stress. I started playing Marzo’s CD while performing other tasks, and quickly discovered that her meditations had worked their way into my subconscious mind, so much so that I began unconsciously integrating bits and pieces of her key phrases into my vocabulary. My favorite part of the CD, however, is not the meditations (I much prefer the gently guiding simplicity of the final "Coming Home" meditation track over the more ambitious "Healing the Inner Child"), but the thirteen glorious minutes filled with the sound of thirteen female voices chanting the ancient and very powerful "MA" sound. I am certain that the middle track will become well worn with use as Marzo’s "MA" recording has got to be one of the most soothing and connecting meditative tracks on planet Earth. Very, very soothing. Goddess & Child is a wonderful retreat from daily stress and strife and a useful ritual. Marzo has done a wonderful job of integrating the beautiful and spiritually enhancing "MA" chant with useful meditations that are certain to bring peace and relaxation into one’s life. This is an excellent meditation CD. The first time I tried it was after a very difficult trip, spent in extremely high energy. I ran a hot bath filled with sage and lavender salts, lit a candle and popped it in the CD player. This CD addresses each body part and provides a visualization to help to relax each part of my body. The relaxation worked better than anything I have ever experienced. The next time I tried this CD was in a full moon meditation ceremony. It allowed everyone to relax, including the Priestess/Priest. Everybody commented on how much they enjoyed it. It has three segments which can be enjoyed together or separately. This CD is very well recorded. It provides the listener with an excellent lead meditation. It covers several good subjects and its main goal is to help heal the inner child which it does very well. I would recommend this CD to anyone that feels they need work on meditation. Do you like to dance? Trance dance with a special message? from her Goddess & Child CD and created this unique Dance Beat version. "Tyler is a Vancouver DJ who contacted me about this new musical offering based on my Goddess & Child CD. "When I asked him how he found me, he said that he grew up listening to my voice when a family member was dealing with the challenge of cancer and my CDs were played many times in his home to help in the healing process. "So when he was ready to create sometime new, he wanted to use my voice and the message I was saying. Healing the Inner Child was going out to reach a whole new generation. Wow! "Tyler and I decided to donate a substantial portion of the sales of this creation to the Cancer Society. "So, listen to it, dance and move with the groove. Allow the message to drop in and share it.